Is Beef Jerky Good for a Workout Routine? Dani Arbuckle is a successful business writer with expertise in general management and strategic management. Arbuckle is also an active runner and marathoner who writes extensively on running and other sports. Athletes need more protein than the average sedentary person. To get the extra protein needed to repair muscles and tissue after workouts, you don't necessarily have to load up on supplements like protein powder. 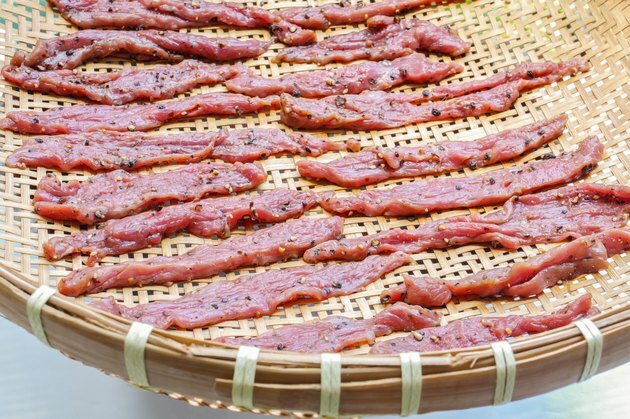 Beef jerky, a flavorful, protein-rich whole food, can help you meet your nutritional needs. Growing athletes and those building muscle mass need 0.6 to 0.9 grams of protein per day for every pound of body mass. For instance, a 180-pound athlete needs between 108 and 162 grams of protein per day. According to sports dietitians Michelle Rockwell and Susan Kundrat, beef jerky can be a good source of portable protein when you're at the gym. Forty grams of beef jerky has 14 grams of protein, making it a perfect post-workout snack. Rockwell and Kundrat note that a post-workout snack should have around 10 to 20 grams of protein. Can You Build Muscle Without Eating a Lot of Protein? What Age Can You Start Taking Protein Powder?